New YouTube mashup sees the Downton Abbey cast sing One Direction 'What Makes You Beautiful'! YouTube user Buchan39 has mashed together various Downton Abbey clips over the top of the One Direction hit. The result is remarkable... 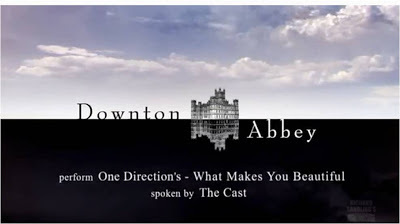 The video jumps around a bit, but I think it's very clever and can't imagine how long it took to mash One Direction and Downton Abbey together! Thanks Rik for the link - and another example of how creative YouTube users can be...! this video is amazing! there's also "Downton Abbey Kids" on youtube, another great video, look it up!